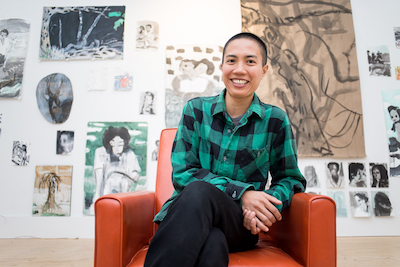 Maia Cruz Palileo is a multi-disciplinary, Brooklyn-based artist. Migration and the permeable concept of home are constant themes in her paintings, installations, sculptures, and drawings. Influenced by the oral history of her family’s arrival in United States from the Philippines, as well as the history between the two countries, Maia infuses these narratives using both memory and imagination. When stories and memories are subjected to time and constant retelling, the narratives become questionable, bordering the line between fact and fiction, while remaining cloaked in the convincingly familiar. Maia is a recipient of the Joan Mitchell Foundation Painters & Sculptors Grant, Jerome Foundation Travel and Study Program Grant, Rema Hort Mann Foundation Emerging Artist Grant, NYFA Painting Fellowship, Joan Mitchell Foundation MFA Award and the Astraea Visual Arts Fund Award. She received an MFA in sculpture from Brooklyn College, City University of New York and BA in Studio Art at Mount Holyoke College, Massachusetts. Maia has participated in residencies at Skowhegan School of Painting and Sculpture, Maine, Lower East Side Print Shop, New York, Millay Colony, New York and the Joan Mitchell Center, New Orleans. I spent the summer of 2017 researching images from America’s colonial period in the Philippines at Chicago’s Newberry Library. I studied Damián Domingo’s watercolors of the various people who lived in and around Manila in the 1820s, El Folk-lore Filipino, a book written in 1889 by folklorist and revolutionary, Isabelo De los Reyes, and the Dean C. Worcester collection of ethnographic photographs from 1899-1903. Worcester was an American zoologist turned Secretary of the Interior for the United States government. These collections encompassed multiple points of view over the course of the 19th century, including the Philippine Revolution and the Filipino-American war. Together, they presented an image of Filipinos constructed through native eyes and through the eyes of the other. This phenomenon mirrors the fractured feeling of multiplicity and shallowness many of my generation describe when asked about the Filipino-American identity and historical knowledge. My new body of work draws from this research, re-contextualizing stories, portraits, and images. The Worcester archive is a collection of exploitative and dehumanizing photographs. I was drawn to the people in the pictures with the impulse to pull them out and away from this historical framework. With the detailed and loving care of Domingo’s watercolors in mind, I began to draw figures, plants, landscapes, and other elements from the archive. Then, I cut out each drawing, creating a new library of cutouts: figures, plants, animals, interiors, boats, moons and mountains. The pieces were then placed in various arrangements and recorded via graphite rubbings. This process allowed for the cutouts to be combined into potentially infinite visual narratives. The new works re-assemble these elements into compositions inspired by De Los Reyes’ El Folk-lore Filipino and Nick Joaquin’s short stories, May Day Eve and Don Jeronimo. Folkloric beliefs in protective amulets and animals who can predict death mingle with Joaquin’s multi-generational characters who perform incantations in mirrors and struggle to free themselves from spell-like promises and illusions. In the paintings, deep blues and reds suggest nocturnes: dark realms where superstitions, myths, and history blur. Figures with long hair, head wraps, mustaches, soldiers caps, and second hand western t-shirts engage in surreptitious rituals under various phases of the moon without explanation or caption.